Oshkosh, Wis.— Continental Girbau Inc. (Continental), in Oshkosh, Wis., recently welcomed Dave “Mac” Mc Allister, of Berlin, Wis., as director of services and product development. Mc Allister, who fills a newly created position at Continental, oversees customer and technical service areas for all Continental subsidiaries. He is also a member of Continental’s seven-person Executive Committee. Mc Allister, who has managed technical, engineering or development teams over the past 23 years, holds a decade of experience related directly to the commercial laundry industry. 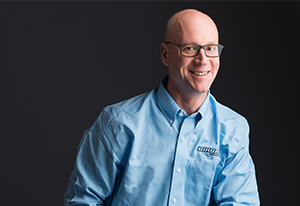 Since 2000, he’s climbed the ranks at Magnum Products LLC (now Generac® Mobile Products), in Berlin, Wis. During that time, he directed engineering and product development efforts. In his new role at Continental, Mc Allister manages the customer service and technical service departments; innovates strategies to help the company meet strategic goals; implements tactical operations plans for enhanced customer experiences; and monitors Girbau Industrial work procedures and schedules. Mc Allister holds an associate’s degree in automotive technologies from Fox Valley Technical College, in Appleton, Wis.
To find out more about Continental Girbau visit their website or call 800-256-1073. Continental Girbau Inc. is the largest of 15 subsidiaries of the Girbau Group, based in Vic, Spain. Girbau laundry products – marketed throughout 90 countries worldwide – meet rigorous environmental and safety standards established by the International Organization for Standardization (ISO). Girbau S.A. holds both ISO9001 and ISO14001 certifications. Ever focused on laundry efficiency, Continental Girbau is a member of the U.S. Green Building Council (USGB), a 501(c)(3) nonprofit that developed the Leadership in Energy and Environmental Design (LEED) Green Building Rating System.